Feeling confused about your Medicare Part D coverage? Wondering if you picked the wrong plan or if you’re spending too much? You’re not alone. In fact, Beth Monnat, our Benefits Specialist, has helped 38 clients review their coverage this enrollment season, and only 4 of them were enrolled in the correct plan! With her expertise, she’s helped those 38 clients save a total of $34,872.01. That’s an average of almost $1,000 per person! And she can help you too. Book an appointment with Beth today. But hurry! Open enrollment ends Decemeber 7. You’ll be in good hands with Beth. She has more than 30 years experience in Social Security and Medicare. And she has 12 years experience working almost exclusively with Medicare Part D.
Cut through the confusion and save money––call (217) 726-9200 to book your appointment or click here to learn more. It takes two attorneys — one to represent the senior and one to represent the party trying to gain guardianship — along with court fees and fees to serve the summons. It’s an official legal process without any shortcuts, and that means red tape and expense. 2. Other family members are involved in the process. (And that may not be a good thing.) Much like when a Will goes through probate, all family members must be made aware when a guardianship is being filed. Children, siblings, parents, etc. all have to be officially notified. This is not only difficult for the privacy of the person who may need the guardianship, but it can also invite interference and disagreement amongst family members, complicating an already stressful process. 3. Guardianship doesn’t solve all the problems. Many people approach guardianship with the unrealistic expectation that it will suddenly resolve the difficult situation they find their family in. The guardian has authority (and responsibility) for representing the disabled person in dealing with others (medical providers, financial institutions, etc. ), but there is one person who may not honor the guardianship — the disabled person. If a family is dealing with an uncooperative individual, guardianship isn’t going to suddenly make that person compliant. 4. Guardianship is an EXTREME option. 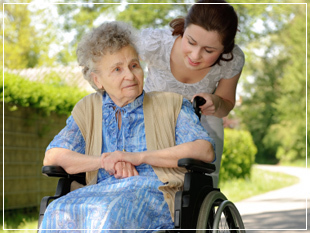 If guardianship is so terrible, what can you do to avoid it? Attorney Amanda Lundeen gives four tips to avoid this mess yourself. Check it out in this blog post. Most people don’t know how to effectively manage the issues that come about with aging. They only handle it once or twice in their lifetime. Edwards Group sees it all the time, and that’s why we developed a holistic way to help families think through the legal, financial, and care issues that unfold as someone ages. Our team is uniquely qualified to provide services and support to families who have questions and concerns about aging, illness, and long-term care needs. Give us a call at 217-726-9200 and ask to speak with an Elder Care Advisor today. Every week we talk with several families who are worried about the challenges of aging and call us for help. Recently, a family was concerned about mom’s declining memory and dementia. Mom is mostly unaware of her inability to handle things on her own and really wants to keep control of her keys and the checkbook. She has handled these things for years and is not about to give them up. Dad is worried about Mom. He’s concerned she’ll wander off or drive somewhere and get lost. He’s increasingly uncomfortable leaving her home alone, worried she’ll try to use the stove and not remember to turn it off. At the same time, he feels terribly guilty when he thinks about taking away the car keys. He feels really stuck and unsure of what to do. The daughter lives only five minutes away. She is worried sick about her parents, and the situation is adding a lot of stress to her life. She knows her mom is unsafe, so she does all she can to help, but she has a family of her own and works full time. Because her dad is stuck and doesn’t know what to do to keep her mom safe, she is feeling immense pressure to be the parent of her own parents. This is a really uncomfortable spot for her. The son lives really far away. (Let’s say Florida.) He tries to come home every year, but it’s been almost 18 months since he’s been back. He thinks his sister is trying to be too controlling and take over everything. He knows his mom and dad have slipped some, but they seem fine when he calls them every few weeks. all mixed up together in a big, stressful situation. How can we bring this family together to make the right decisions? This situation is hard. But this situation is a common one. To maneuver more easily through these types of life changes, families need help with legal, financial, and care decisions. This is what we do every day. Are you facing a situation with an aging loved one where you could use some guidance from someone who has walked through these issues before? Or do you know someone who is struggling with a similar situation and doesn’t know what to do? We encourage you to call our office for immediate help. Our Elder Care Advisors will be happy to speak with you at 217-726-9200.